Bob Cowan reports that Angie Malone, who fans will remember played lead for Frank Duffy at the 2006 Torino Paralympics, skipped her team of Ian Donaldson, Jim Elliot and Jim Taylor to a 6-4 win over Jim Gault to win the British Open Championship at Kinross this weekend. 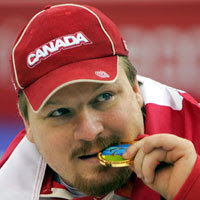 The final day's action, two 6-end draws, began at 8.30am and saw Canada I beat Fraser 13-1 and Canada II beat USA II 7-4. The final draw featured the marquee match-up, Armstrong against USA I's Perez. It ended honours even in a 4-4 tie. Canada II beat Fraser 7-2. Recreational winners - Lennoxville Quebec - Ben Lasard, Carl Marquis, Jacques Martin and Denis Paradis. The last time Gerry Austgarden faced USA skip 'Goose' Perez he was shaking hands after lead stones in the final end of the game that gave USA their first World Championship medal. In Draw 3 this morning revenge was sweet as he led Canada II to a 8-6 win over USA I. Canada I remained unbeaten with a 10-4 win over Bradford. In Draw 4 this afternoon Canada I raised their record to 4-0 with a 12-4 win over Cameron, while Canada II beat Chris Rees' Toronto 6-2. In Draw 5 this evening Canada I beat Rees 12-4 and Canada II beat Cameron 8-2. Both Team Canada squads had solid wins in the morning draw. Canada 1 blanked USA II by 15-0, and Canada II beat Bradford 9-5. In the afternoon draw Canada I skipped by Jim Armstrong, beat Gerry Austgarden's Canada II by a score of 8-2. Canada and USA have announced their teams for the 3 day Ottawa spiel starting tomorrow. Canada I - Armstrong (skip), Neighbour, Forrest, and Cormack all from BC. Canadian coach Wendy Morgan was at pains to point out that their teams did not indicate who would represent Canada at the 2009 Worlds. That decision will be announced next week so that the team can play together at the Richmond International spiel the following weekend. Armstrong, Neighbour, and Forrest are favourites to make the cut, with Gaudet the alternate if coach Rea follows past practice of including two women. That would leave Torino gold medallists Austgarden and Cormack competing with Yizek and Sobkowicz for the remaining front end position. Performance this weekend will influence selection, but all things being equal the vote may go to Sobkowicz in a move away from an all-BC team. Have an opinion? Post it in the comments. The USA trials last weekend was the major factor in deciding which 8 athletes would compete in Ottawa. USA I, bronze medallists at the 2008 Worlds, appear to have weathered the challenge of 6 other athletes though a final decision on the 2009 Team USA will not be officially announced until December 14th, after the US Open. 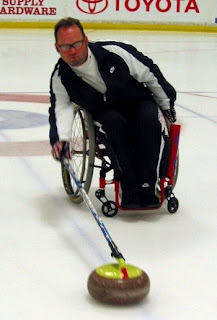 Corrinna Pole writes in The Record (Sherbrooke, QUE): Last year, a Wheelchair curling program, the first of its kind in the province, was a pilot project at Lennoxville's Curling Club. Now the team is even closer to becoming a full league with high hopes of branching out. "Come try this sport in a welcoming, non-competitive environment geared toward new participants. You just come and have Fun!" Contact CurlBC for more information. On delivering a rock from a wheelchair with a stick, Armstrong said: "The feel eventually comes through. But what I was used to was doing it from the hack to the hogline [before letting go of the rock]. Now I'm doing it in two feet." Germany stole their way to a win over Russia in the 1 v. 2 Page playoff game at the Worlds Qualifying tournament in Prague, to claim the first of two slots at the 2009 Worlds in Vancouver next February. Though Russia stole singles in the first two ends, Germany stole 3 in the 4th, and singles in the 5th and 6th on their way to a 6-5 win. In the 3 v. 4 game the host Czechs started with the hammer and took 2 from China, but that was to be the end of their dream as they gave up 5 in the second and failed to score the rest of the way as China ran out 11-2 winners in seven ends. Russia then played China for the second qualifying slot, but despite having the hammer, only managed a consolation single in the 7th end, China winning 13-1. Germany and China will join Norway, Korea, USA, Canada, Italy, Sweden, Scotland and Switzerland In Vancouver. Germany (8-1) topped the 10 team field after round robin play at the qualifying tournament for the final two places at the 2009 Worlds in Vancouver next February. Hosts Czech Republic, 2008 Worlds competitor Russia and China, who gave Germany their only defeat, were all 7-2 and will play in the Page play-off Thursday. Germany v. Russia - winner takes first qualifying spot, loser plays winner of China v. Czech Republic for the second qualifying spot. CLICK HERE for live line scores. Club official Tony Colacchio, inspired, he told me, by a wheelchair curling column to include disabled access in the club's $500,000 renovation plan, hopes they can attract a core group of wheelchair users to challenge for places on the USA national team. Norway, Sweden, Scotland and 5 teams from Switzerland competed in Bern for the 2008 Rolli Cup. Each pool of 4 teams played 3 round robin 6-end games on Saturday. Norway (3-0) beat Scotland 12-2 in one semi-final while Lausanne Olympique (2-0-1) lost to Bern II in the other. In the final Norway blanked Bern II by 8-0 while Scotland claimed bronze with a 10-2 win over Lausanne. CLICK HERE for video coverage of the first weekend of evaluation, and HERE for a News 10 Now report by Jim Gibbons. Ten curlers from six different states will be competing over the next month for Team USA places for the 2009 Worlds and the 2010 Paralympics, both to be held in Vancouver. Tryouts begin in Utica this weekend November 14-16, and evaluations will continue during the Cathy Kerr bonspiel in Ottawa November 28-30, and conclude at the USA Open in Utica December 5-7. CLICK HERE for a press release detailing who will be competing, and GO TO THIS PAGE and click on the 2010 Olympic Team Selection Link to download a detailed description of eligibility requirements and selection protocols. Chris Daw is recovering from a broken hip in the Health Sciences Center in St. John's, Newfoundland. He is expected to be there till Friday. We wish him a speedy recovery. Patrick McDonald, a member of the SF Bay Area Curling Club can be seen here practicing in hopes of qualifying for Team USA. 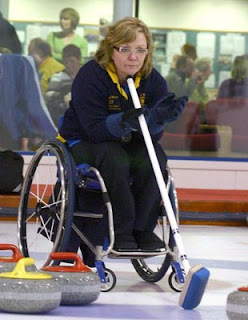 Ottawa's Capitol Wheelchair Curling Club will host the 4th Annual Cathy Kerr Memorial bonspiel, November 28-30. Team Canada and Team USA will each field two teams and go head to head in their first match-up since the bronze medal game at the 2008 Worlds. Four Ontario teams, Rees, Cameron, Gregory and Fraser make up the eight team field. The event will take place at the RA Curling Club and the Nepean Sportsplex. Contact Bruce Cameron for more information.